The Research and Education Network of Uganda (RENU) wrapped up the year 2015 with a fourth network engineering training workshop of the year that saw 24 network engineering personnel from the NREN’s member institutions benefiting. 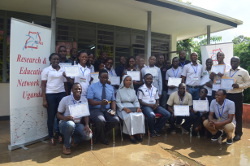 The training, which was held at the Uganda Martyrs University, Nkozi Campus under the theme: “Campus Network Security.” took place from 30th November to 4th December 2015 and was followed by a Direct Engineering Assistance exercise from 5-8 December 2015. Commenting on the workshop, held with support from UbuntuNet Alliance, the International Network for the Availability of Scientific Publications (INASP) and the Network Startup Resource Center (NSRC) RENU Chief Technical Officer Nicholas Mbonimpa said the training focused on network security since the performance and efficiency of a network is heavily reliant on its security. Mbonimpa said participants to the workshop were drilled on a number of thematic areas on security including threat models, cryptography, SSH keys and authentication, attack logging and log analysis, secure wireless authentication and intrusion detection. The Campus Network Security workshop is the fourth training for RENU for the year 2015. Earlier in the year, the NREN was involved in Scalable Campus Network Design, Campus Wireless and Network Monitoring and Introduction to Unix/Linux training workshops. Within 2015, the network has held a total of 7 Direct Engineering Assistance (DEA) exercises. Commenting on the yearly performance of RENU from a networking and connectivity point of view, the Chief Technical Officer says the NREN has chalked significant progress in 2015. Looking ahead to 2016, Mbonimpa said while continuing with the network expansion drive, the main focus for 2016 will be harnessing standard network services.